Visitors to the rink will be given a directory of businesses offering discount products and services to skaters and local businesses will be able to fly advertising banners rink side. The rink will be open ten hours a day, noon to 10:00 PM, skates will be included in the admission cost. Adults will skate for $15 per hour while children will be on blades for $12 per hour. Negotiations are underway to host a hockey clinic for junior Gretskys and a figure skating demonstration and clinic may be scheduled. The rink will be open December 26th avoiding the conflict of other holiday events and remain open through January 1st. 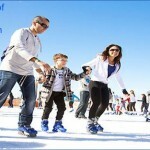 For more information log onto www.redlandsonice.com…. you can even buy tickets on line to insure that you will be one of the first skaters to hit the ice.